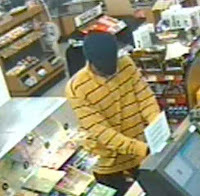 Suspect sought for armed robbery at Goose Creek gas station | Crime Stoppers of the Lowcountry: 554-1111 | 1-888-CRIME-SC | Anonymous tips earn cash rewards with Crime Stoppers of the Lowcountry. GOOSE CREEK, SC (WCSC) - Investigators are on the lookout for a man who robbed a Goose Creek gas station early Sunday morning. The Goose Creek Police Department says around 3:58 a.m., a man entered the Kangaroo gas station on 215 Red Bank Rd. The suspect took out a small caliber revolver and demanded cash and cigarettes from an employee. The suspect then ordered the victim to put the cash and cigarettes into a small blue duffle bag. Police describe the suspect as a light skinned black male, 25 to 35 years old, 6-foot tall and between 150 to 160 pounds. He was last seen wearing a long sleeve yellow polo style shirt and dark baggy jeans. If you have any information you are asked to call Inv. Todd Mason at (843) 863-5200 ext. 354 or Crime Stoppers at (843) 554-1111.